Hi everyone!! It's my turn over at Twine It Up! 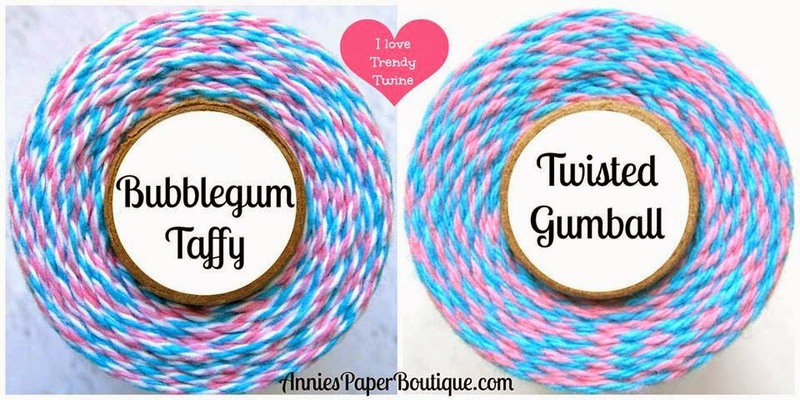 with Trendy Twine and today I have a treat box you can get from Annie's Paper Boutique (used a bit differently) along with the fun Twisted Gumball Trendy Twine (one of the April spotlights and on sale). But you'll need to head over to the blog to see the whole project ;) I just have that sneak above for you. I used a lot of fun goodies from the store and also a My Creative Time die and stamp. I hope you head over and check it out! And while you are there, be sure to check out this month's challenge. I really hope you enter! Your project looks awesome, I love the sweet little bunny tag and the coordinating reinforcement with the twine looks fabulous! Great project! A paper treat - this is perfect!!! Great idea! !